After opening shortly before the 2016 election, the Trump International Hotel in Washington, D.C., has quickly became a favorite gathering place for the president's supporters. It's the first ruling in federal court to define "emolument," which goes undefined in the U.S. Constitution's two emoluments clauses. Messitte rejected the "cramped interpretation" of the term offered by the Justice Department. He wrote that the term applies to "any profit, gain or advantage" of value that Trump has gotten from foreign, the federal or domestic governments. "Plaintiffs have plausibly alleged that the President has been receiving or is potentially able to receive 'emoluments' from foreign, the federal and state governments in violation of the Constitution," wrote Messitte. Until the Trump administration, emoluments have been an obscure part of the Constitution, said John Mikhail, a professor at Georgetown University Law Center, whose research was cited in Messitte's opinion. "I think it comes as a surprise to many people that there are terms in the Constitution, individual words that at this late date, 230-plus years into the operation of the Constitution, that those have never been authoritatively adjudicated," said Mikhail. The judge's decision clears the way for the Maryland and District of Columbia legal teams to begin the discovery process, which could include requesting sensitive financial information from the president and the Trump Organization. The Justice Department, which represents Trump in this matter, argues the clause is not relevant to Trump's businesses. "We continue to maintain that this case should be dismissed," said Andy Reuss, a spokesman for the Justice Department. It's the second victory for Maryland Attorney General Brian Frosh and D.C. Attorney General Karl Racine, who were granted legal standing to sue Trump in March. They allege their jurisdictions are economically and financially harmed as political and diplomatic officials shift their business to Trump's downtown Washington, D.C., hotel from nearby convention centers owned by those governments. "Today's historic ruling is a substantial step forward to ensure President Trump stops violating our nation's original anti-corruption laws," said Racine. "The Constitution is clear: The president can't accept money or other benefits from foreign or domestic governments." After opening shortly before the 2016 election, the Trump International Hotel has quickly became a favorite gathering place for the president's supporters, who frequently hold fundraisers and conferences there. Foreign governments have also held events and put dignitaries up in the hotel. The hotel is housed in the Old Post Office, which is owned by the federal government and leased by the Trump Organization. Legal challenges to the Trump Organization's lease on the property have not succeeded. Now an update on a lawsuit against The Trump Organization and President Donald Trump. A federal judge has rejected an attempt to dismiss a lawsuit that says the president is violating the constitution. NPR's Peter Overby reports. 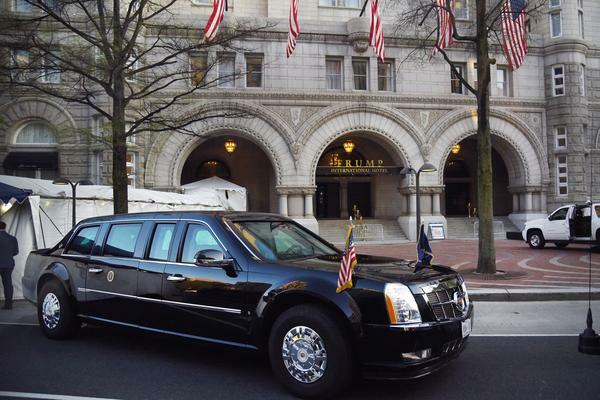 PETER OVERBY, BYLINE: Just days before the election in 2016, candidate Donald Trump staged a grand opening of his Trump International Hotel near the White House. PRESIDENT DONALD TRUMP: With the notable exception of 1600 Pennsylvania Avenue, this is the most coveted piece of real estate in Washington, D.C. - the best location. OVERBY: The hotel became a magnet for foreign governments to spend money. And today, federal District Judge Peter Messitte in Maryland gave the go ahead to an anti-corruption lawsuit involving the president and his hotel. The attorneys general of Maryland and the District of Columbia alleged that the foreign government spending at Trump International violates the Foreign Emoluments Clause of the Constitution. The attorneys general say Trump's own connection to the hotel violates the Constitution's domestic Emoluments Clause partly because the hotel building belongs to the federal government. All along, the question has been, what's an emolument? That's what Judge Messitte dealt with today. He rejected what he called a cramped interpretation by Justice Department lawyers. They'd argued that an emolument had to involve a presidential action and a gift - the same as a bribe. Messitte adopted a much broader definition advanced in a friend of the court brief. It said that when the Constitution was written, emolument generally meant a profit, gain or advantage. Remarkably, the emoluments clauses had never been hashed out in federal court - not until the Trump administration. John Mikhail, a professor at Georgetown Law, did the research cited in the judge's opinion. JOHN MIKHAIL: I think it comes as a surprise to many people that there are terms in the Constitution, individual words that have, you know, at this late date, 230-plus years into the operation of the Constitution, that they - that those have never been authoritatively adjudicated. OVERBY: For the Maryland and D.C. attorneys general, the next step is discovery, a chance to get documents and take depositions from Trump's organization. Justice Department spokesman Andy Reuss said they still maintain the case should be dismissed but are determining next steps. There are two other emoluments cases against Trump. Plaintiffs are appealing one of them in federal court in New York. The other is pending in federal court in D.C. Peter Overby, NPR News, Washington. (SOUNDBITE OF HEXSTATIC'S "CHASE ME") Transcript provided by NPR, Copyright NPR.